Hospitality is not just a word, a sometimes overwhelming word, it is what we are all called to live out. We are called to create a sense of community, care for one another, love one another, support one another. That is true hospitality. How we show and receive this hospitality is the subject of my blog. All too often, when called upon to show hospitality, many of us fall into two categories. Overwhelmed at the idea of having the house clean enough or the perfect menu to serve guests, we miss a golden opportunity to connect with others: hospitality is never shown because we don’t know, or think we don’t know how to it should be shown. Or, the evites go out, and we try to overachieve, wearing ourselves out trying to make everything perfect before the first ring of the doorbell. Exhaustion takes the place of hospitality for ourselves and our guests. Your humble correspondent from the front lines of hospitality falls into the later category. I even froze up the other day when my wonderful neighbor offered to help carry my groceries into my house as I unloaded them from my car. I immediately thought, “the house isn’t tidy, but not quite messy, did I leave the laundry on the living room table, and why isn’t my vacuum cleaner picking up all the dog hairs…” Had I been less of a perfectionist, I would have enjoyed the conversation with my neighbor. This lead me to ask myself, what does hospitality really mean? The official definition is above, but how does it translate into our every day lives? I suggest that hospitality isn’t just about inviting others into our homes, but creating opportunities to connect with and bless others. Sound like a huge undertaking? It is deceptively simple. I will show you how to throw a dinner party that will taste and look great, and not require you to self medicate during the preparation with the wine you planned to serve with dinner. Follow my blog, and you will learn how to make a neighbor a welcome or thinking of you basket. You may even offer to host a wedding shower or engagement party using my tips. Soon, these events will become unique and joyous expressions of who you are: hospitality will become a habit. Your hospitality will bless others, and their gratitude will show you how blessed you truly are. Let’s start simple. We are well into summer and whether you are lucky enough to live in the west and escape the bugs and humidity, or just lucky like we have been so far this summer in Virginia, entertaining outside is a joy! A few weeks back I realized with the long hard winter we had not socialized with most of our neighbors yet this year. So I sent an email invitation that set a date, and assigned tasks for a good old fashioned block party. We brought the burgers (Costco frozen sirloin) and dessert. I had everyone else bring a side or munchies of some sort and their own beverage. 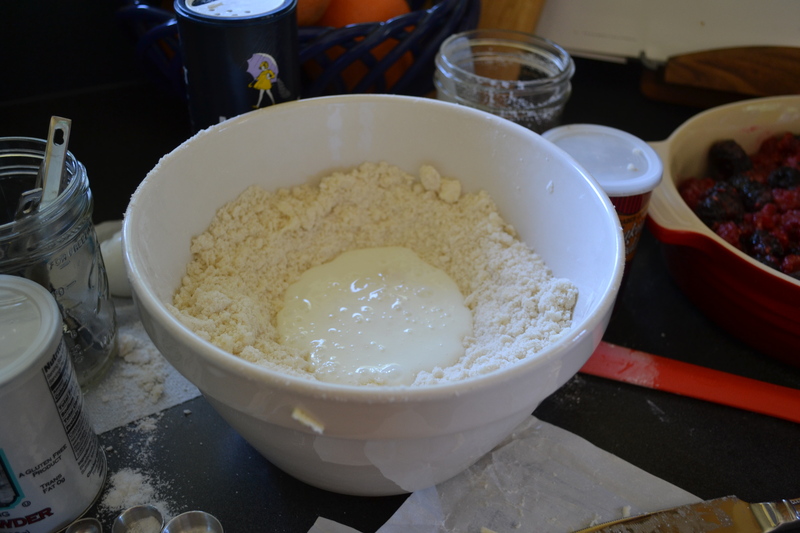 Best part…. no one came inside my house (and I cleaned the bathroom for no reason!). 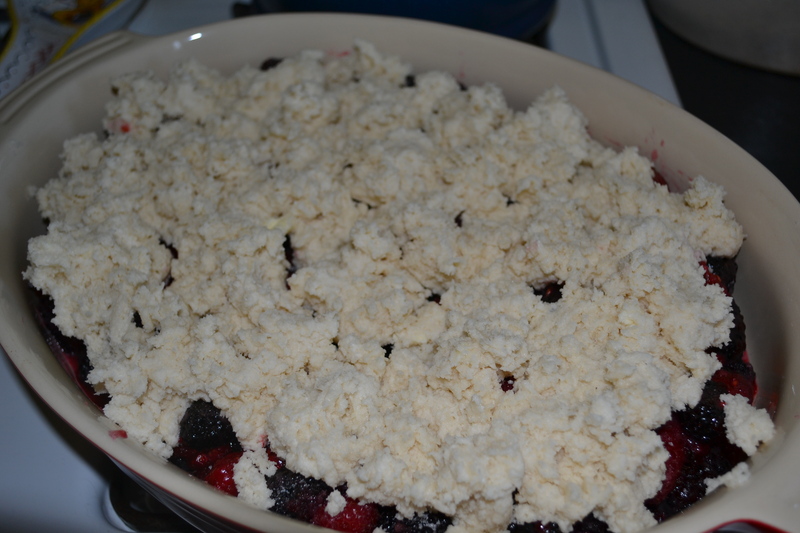 I didn’t even need to clean the dishes I used to make the berry cobbler. 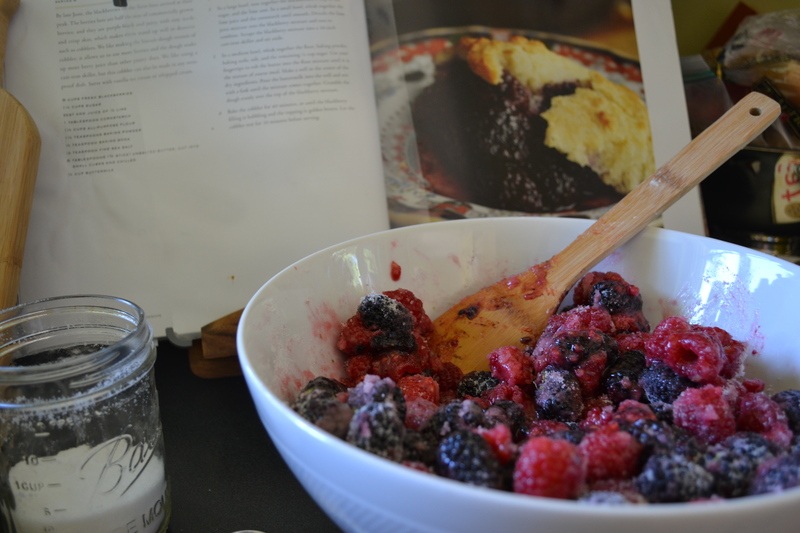 I used a recipe from one of my favorite cookbooks as a guide, The Blackberry Farm Cookbook. If you ever have the occasion to purchase it, do! 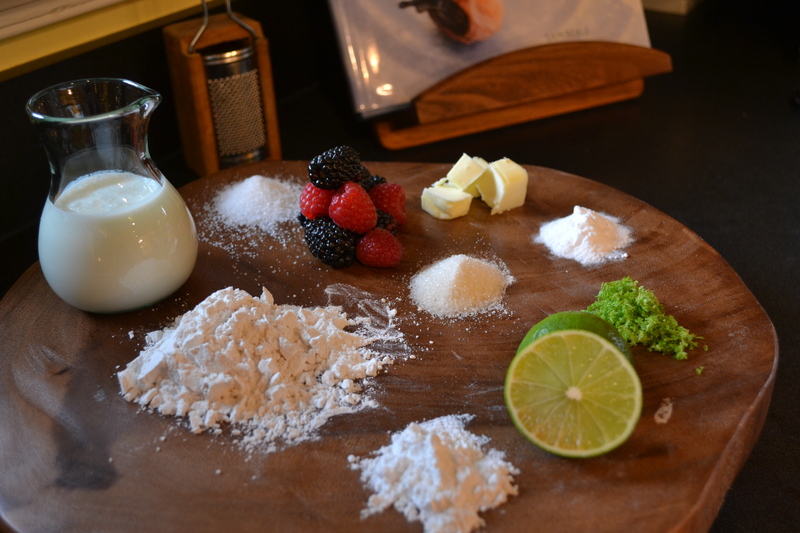 Such wonderful recipes and pictures to spark the imagination. We invested in a collapsible buffet table earlier this year, thank you again Costco. 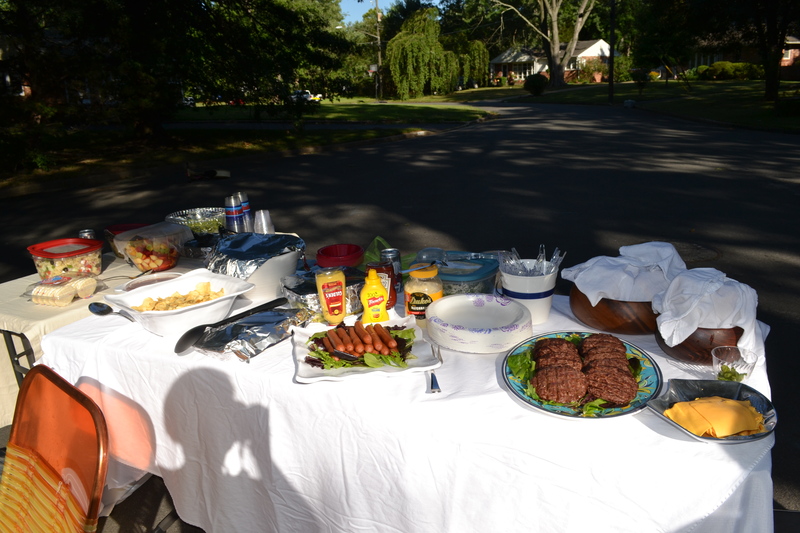 We set up the table in the street, threw a table cloth on, and put out a couple of our lawn chairs and we were set! Hostess tip: play some music to add a soundtrack to the festivities. Use a bluetoooth speaker (tons are available and affordable on Amazon), sync it to your iPhone or Android device, and dee jay your party. And away we go! I use my three C method for party preparation. Cart (what you will need on hand and to get ready to cook), create (how to prepare the recipe), and curate (how to bring it all together and make it look great). 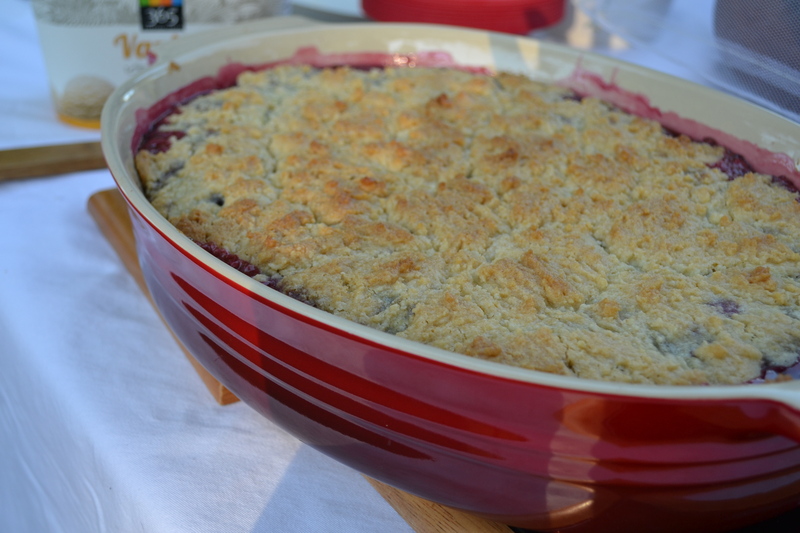 Choose an iron skillet or baking dish large enough for your party. I doubled the recipe for this occasion. 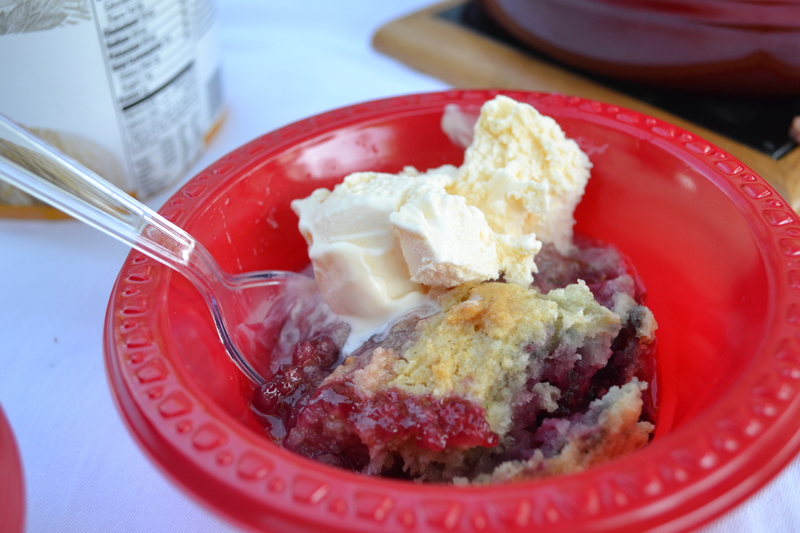 I presented the cobbler in the baking dish with a wooden spoon for a rustic look. 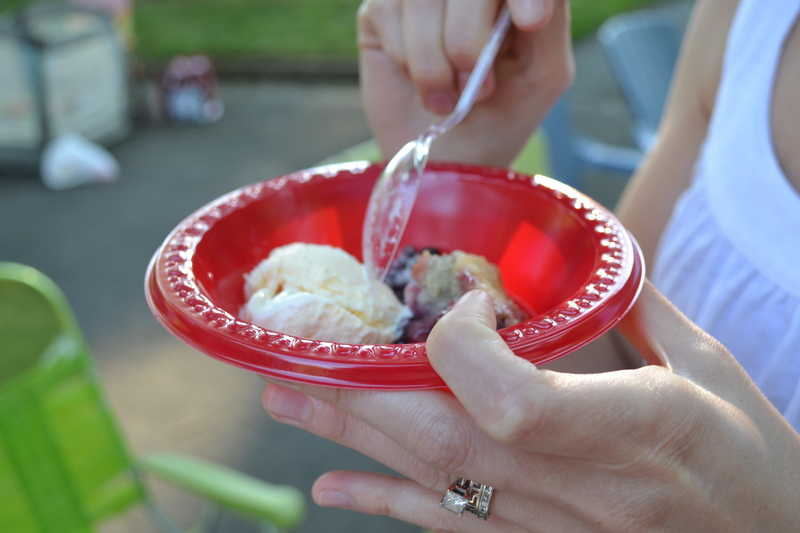 Served in small plastic bowls with a scoop of vanilla ice cream. Perfection! Excellent blog and great ideas !